Summer is getting so close! Are you ready? I'm not! My toes need a pedi, and my skin needs some color. I don't want to get a real tan in the sun, so I totally fake it. Today's self-tanners give you a natural glow--no more orange, streaky color. 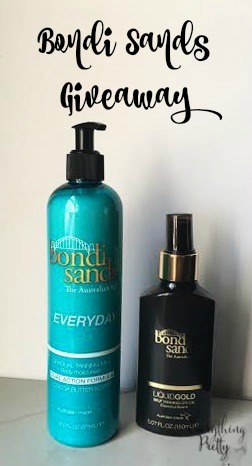 Bondi Sands recently sent me two products to try, and they are giving both of the products away to one of my lucky readers. Keep reading to see how I liked them and to enter to win your own. Bondi Sands Gradual Tanning Milk is made for daily use. It doubles as a moisturizer and self-tanner, so it gradually builds your tan. This is great if you want a natural glow that will last longer because you add to it every day. It has aloe vera and vitamin E to nourish your skin and a wonderful cocoa butter fragrance. I really love this for the spring so I can build a gradual tan. I used it on my arms and neck for a sun-kissed glow. Bondi Sands Liquid Gold is a self-tanning dry oil with a delicious coconut scent. It works in just an hour and lasts up to a week. It has argan oil to keep your skin soft, too. I used this on my legs so they had some color. It developed a beautiful color that lasted almost a week, even with shaving and showering. If you're new to self-tanning, there are a few things you should do for a better tan. You should always exfoliate your skin. I like to make sugar scrubs like this strawberry mojito sugar scrub because they are easy, inexpensive, and work great. Don't use any lotion or oils before you apply self tanner. They will interfere with the color, and your tan won't be even. That's why I really liked the Bondi Sands self-tanners because they are moisturizing, so I don't need a separate product. When you apply the tanner, be sure to apply it evenly all over your skin for an even tan. The only exception is your knees, elbows, and ankles. Since these areas have thicker skin, they can get darker with the same amount of self-tanner, so go lightly on these areas. Ready to try Bondi Sands self-tanner yourself? Enter to win below! Offer valid for United States residents 18 and older. Good luck!